No better month exists for taking a ghost tour than October. Halloween is the perfect time to stroll through areas reported to be haunted. Key West, Florida, is the pinnacle destination for a ghost tour. Visitors often capture unexplained phenomena on their cameras. 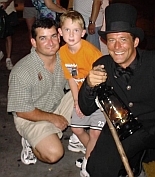 Your guide will greet you wearing a black formal Victorian-era top hat, caped coat and an old-style lantern. Already tingles begin to flow down your spine. As you tour Bone Island, you’ll hear the real history, legends, myths and tales of hauntings and other mysterious events. You are encouraged to bring cameras, both still and video, plenty of memory cards, film and batteries to capture the sights, both seen and unseen to the naked eye. Nothing is staged for the tourists; everything is real. Purchase your tickets a https://www.trustedtours.com/store/key-west-ghost-tour.aspx. Discounts are available for groups and all ages are welcome. The tour is family friendly, and nothing is said or done to frighten children. The tours begin at 423 Fleming street, near the intersection with Duval street. Come at least a half- hour early with your tickets. The tours begin at 8pm and at 9pm, rain or shine. It’s best to make reservations no later than 24 hours before the tour, as group size is limited. Wear comfortable walking shoes, and bringing a bottle of water is always a good idea. The tour lasts approximately one and a half hours, so be prepared to see and learn a lot. Ask your tour guide about recording devices so you can bring the experience home with you to relive with family and friends. Plan the rest of your trip around the numerous museums, walking, boating and bicycle tours, sightseeing, and water activities. Restaurants abound, catering to every taste and budget. Hotels are happy to serve families at any time of year in Key West.